One of the most common questions I get from my blog is on how to get a ClickBank refund and initially, I actually did a post about it several months ago here. However as many of you might have known, ClickBank had just recently updated its system along with their interface and although it looks pretty cool, it may be a bit overwhelming to some people which is why I decided to write another post on it. A Brief Look on What ClickBank is About. Ever heard of Amazon or eBay? Well Clickbank is pretty much the same thing, it is an ecommerce store which sells specifically digital products and by that, I mean eBooks. It is a world famous site that many people go to especially Affiliate Marketers because there are a lot of information products that you can buy or promote on your blogs for affiliate commissions. Of course, the commission rate isn’t permanent – it depends on the vendors as to how much they want to give out per sale but I’ll cover more on that later. ClickBank used to be at its peak with high quality eBooks and programs being personally created and sold by hardworking people but for the past few years, I have seen the quality dropping. People no longer create digital products out of their own sweat and tears. Instead, they pay other people to create cheap quality products just so that they can re-brand for their own purposes of selling and price mark-ups which explains why some eBooks or programs you buy there are either a low quality one, or just a total rip-off. This explains the high Clickbank refund rate we all know of today but lucky for you, Clickbank really care about brand management so they still stay true to the money-back guarantee policy. Finally! The part all of you must have been waiting for! But in case you prefer reading rather than watching, I’ve also took up the initiative to type it all down in to 5 simple steps on how to get your refund back…. Just the numbers, without the hashtag. 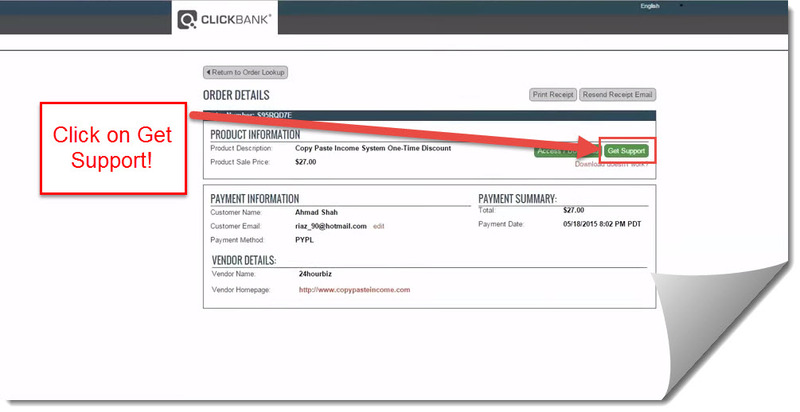 The first step to getting your refund back is by getting your order number which you can find on the receipt emailed to you by Clickbank. For example, mine is “S95RQD7E” for a program I bought called Copy Paste Income. This is probably the most important part because without your order number, you’ll have a hard time trying to make Clickbank retrieve your order but it should be really easy for you since it is usually in your email. Head over to Clkbank.com to reach here. There are 2 ways on how you can go about getting your refund – the first being through the front door which is through the main clickbank website which is the typical way everyone would naturally go about. However that is also the hardest way to get back your refund because since Clickbank knows you’ll be clicking everywhere inside just to reach the refund area, they try to make your life miserable by hiding the button even more. This is intended to make people give up hope and NOT get their refund back which prompts you to watch YouTube or Google out a solution hence finding this page or my video (Thank you!). The second way on the other hand, is a much easier way on getting your refund which is by going to clkbank.com. Yes, that is without the “i” and the “c”. 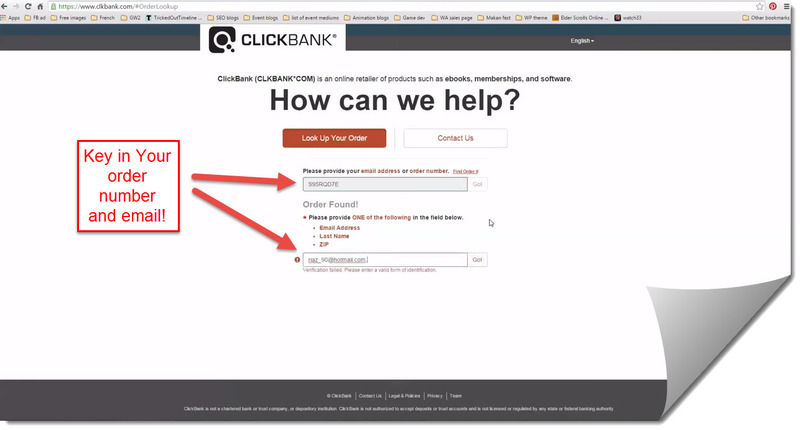 Going to clkbank.com is the ‘backdoor’ which will bring you straight all the way to the support area where you will then need to fill order number and email to look up your purchased product. Your purchased product info will be displayed here. You’re almost there! As you can see now, even when you’ve retrieved your product, the refund button is still nowhere to be found. This is typical of Clickbank as they are always looking for ways to discourage you on getting your refund back as they want to reduce the number of ClickBank refund request that has been increasing steadily over the years. Once you’re on this page, simply click on “Get support”. We’re down to the last two steps and as you can see from the options dropdown, there still isn’t any refund button around! No worries, simply click on “More options” and the rest should come naturally to you. Step #5 – Finally, the Hidden Refund Button! Tick the box, write your comments and you’re done! Tadaa! 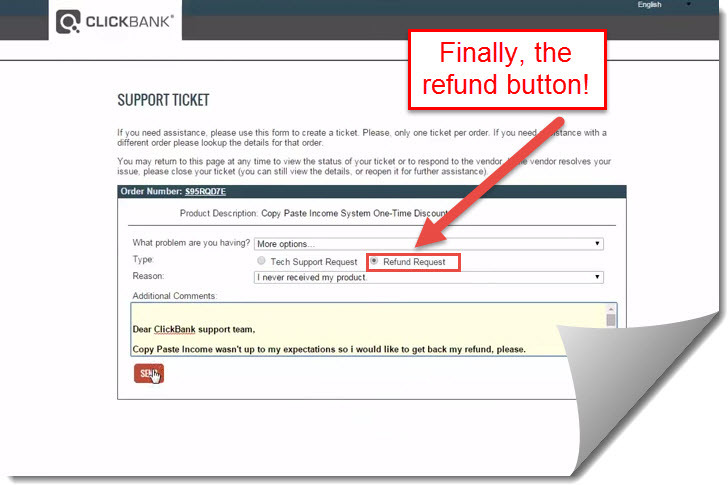 So now you know that Clickbank hides its refund button under the “more options” bar. Simply click on that, write some comments and you’re done! All you need to do now is wait, oh and of course – You have to make sure your Clickbank refund expiration hasn’t reached its due yet too else your efforts will all be in vain. It will usually take somewhere between 1-2 weeks and when that happens, you will definitely know when your money’s in your bank because there will be a notification. When you get an email saying “REFUND,OPEN”, that means the clickbank support team has received your ticket and is currently working on it but what you really want to look out for is “REFUND, CLOSED” because that means your case has been accepted and closed so all you need to do next, is to just wait a week or two till the money’s in your bank. 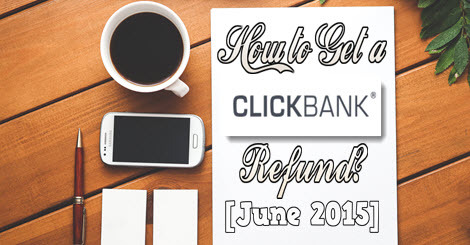 However if after 2 weeks Clickbank hasn’t given you your money back, you will need to contact clickbank refund again by re-opening the old ticket and sending a new one telling them that it has been over 2 weeks and that you should be getting your money back. It has worked well for me every time and I find that this method is way faster as I am able to get my refund back in just within 2 days of the ticket close date which is surprisingly quick of them. What Benefits Do ClickBank Have Compared to Other eCommerce Websites? No Stocks needed – This is by far the best benefit any vendor can get because you’re basically selling things online without thinking of stock-keeping! Since it’s a digital product marketplace, you’ll be selling either an eBook or a program membership which means all profit to you but no cost at all! Money-back guarantee – There are many frauds online which cheats people of their money and many people are having doubts about spending any money on websites due to their insecurities on this matter. Clickbank sees this as an opportunity to enforce a money-back guarantee rule on all its vendors which means that every single product inside have to abide by this rule. The next time you’re on an eBook shopping spree, you’ll have no worries on books you don’t like because you can literally refund them! Want to Make Money Off ClickBank? As you may have known by now, Clickbank is a major ecommerce site for various digital products and that means it is famous for a well-known method of making money online called affiliate marketing. Affiliate Marketing is the easiest way anyone can make money online because all you need to do is basically just promote someone else’s products in exchange for a percentage of commissions for each sale. Although Clickbank has a high rate of refunds, that doesn’t mean all of the products are low quality because there are many good creators inside who personally put in their sweat and tears into creating their own products which have made them millions. 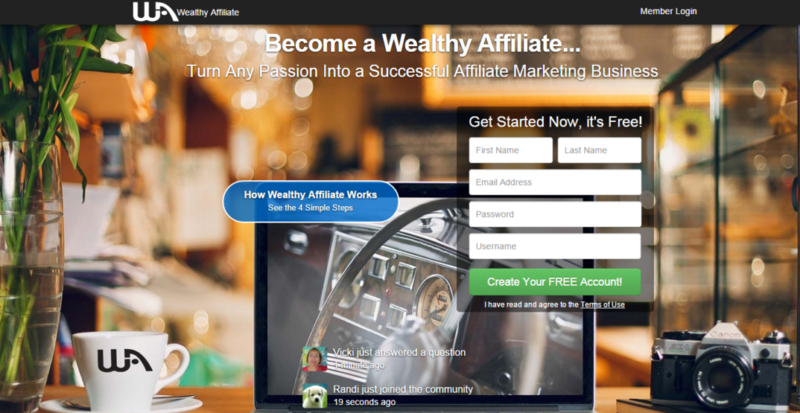 The best course for learning Affiliate Marketing and optimizing your sales is called Wealthy Affiliate. Inside, you will learn all the tricks you need to successfully make a business out of selling other people’s products the right way based on any niche at all. 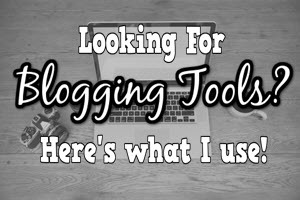 You’ll get all the tools you need such as a free website builder, keyword tool, regularly updated course and an awesome community of people who are just as enthusiastic as you! Flexibility of choosing products to sell is number one when it comes to affiliate marketing and at Wealthy Affiliate, you will learn not only to make money selling other people’s products from Clickbank, but also from Amazon or any other affiliate offers which you find attractive. 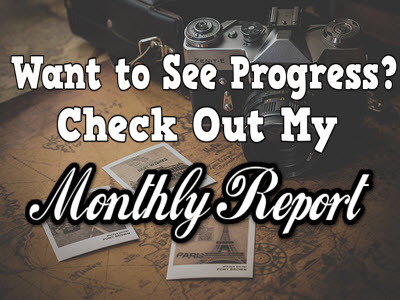 One of the best ways on how to promote your affiliate product is through a review and have you ever wondered how this works? By getting your review on the first page of Google through a well-known technique called SEO and of course, all of these covered within Wealthy Affiliate as well! Although not all my reviews are on the first page yet, many of them are and the numbers are slowly rising which is a very exiting process seeing that your work is loved by others. The owners Kyle and Carson have helped me a lot in building my Online Business (I literally wanted to stop halfway) but they convinced me otherwise and gave me the necessary attention and guidance I need in order to succeed. I feel grateful because without them, I wouldn’t have been here today and this month marks my 14th month as member (Yaay!) which is why if you’re interested in learning on how to build your own online business through affiliate marketing, I would be more than happy to help you out inside. Clickbank may have a good reputation but when it comes to money, they can be very protective that they’ll try to discourage you by hiding the refund button really far back that you can’t access it at first glance. However that is the natural order of businesses because who wants to lose money right? And it’s also why that as long as you keep a receipt of your purchases, you will have nothing to worry about when it comes to getting your refund as you can simply open up a support ticket through the ‘back door’ which I have just showed you. If you’re interested in learning how you can make money off Clickbank as an affiliate, check out my #1 recommended program here. Thanks for reading, I do hope my guide helps and if you have any questions whatsoever do drop them down below as I’ll be more than happy to reply. 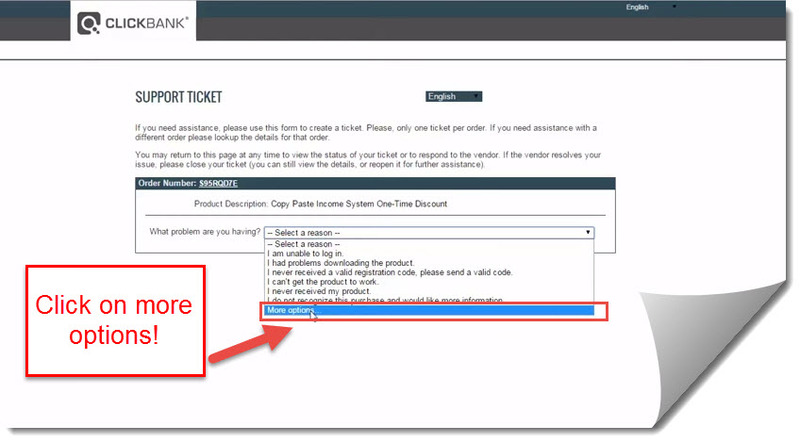 So you can do this with any product purchased through clickbank? How do you know the product was purchased through clickbank? You can do this for any products purchased through Clickbank, Zachary. However not all products have the same period of money-back guarantees. Some have 30 days whereas some others are confident enough to give it 60 days. You can know if that product was purchased from Clickbank if you personally go there to browse and buy. Otherwise, you can always refer to your email to check the receipt, there’s always the company name for each stuff you purchase online. Clickbank started out with lots of legit and high quality information products but after some bad apples spoil the name, people are getting doubtful to ever shop there so having the knowledge to get back your refund in case you ever come across those scams can come in really handy in the future. Thanks for dropping by Andy! This has been very helpful. I joined Clickbank a long time ago but have never used them as I did not realise that they are and electronic informational site. Thank you for this post. Now I know what they do, how to use them and how to claim a refund if needed. Clickbank has some great information products that i still use till today, you should definitely check it out. However there are also many low quality products or worse, scams that you should avoid so having to know how to get your refund back just in case you ever come across it will let you have a much better customer experience where you can shop with ease without the scared of getting scammed. Thanks for dropping by Lis, hope you have a great day! Glad you find it helpful Delroy, thanks for dropping by. Wow, very infromative and covers both the bases of video and text. I am not a clickbank affiliate but feel if I was I would have enough information to go through the refund process quite well! 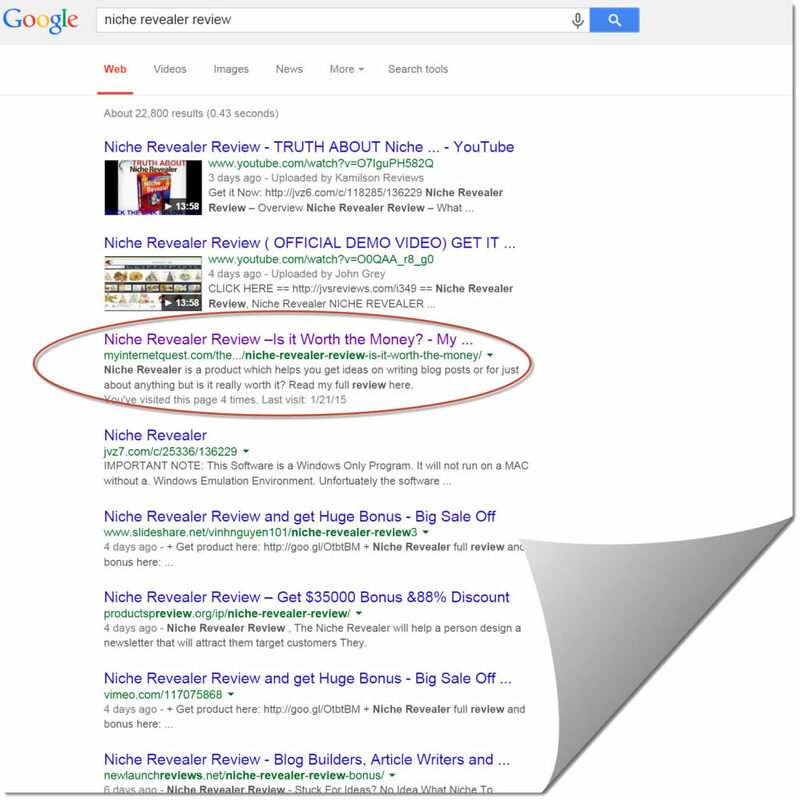 You don’t have to become a clickbank affiliate in order to get the refund but I’m glad my article helped you Kal! Hello, Riaz. I’m glad you wrote this article about Clickbank. 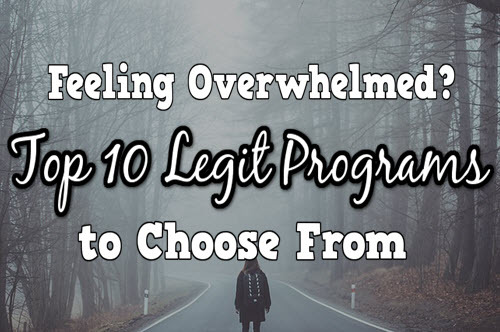 I have used this process a lot since I have been looking for a way to make money online. Thanks to Wealthy Affiliate, I have found the way. Clickbank has never given my any problems with my refunds, of course I contacted the companies first, then Clickbank. Thanks again for sharing! That is one way of getting the refund Peggy, but some sellers are reluctant to give out their refund which is why going through Clickbank will be your best bet if that happens which is why I put together this tutorial. Thanks for dropping by!